here you go, folks. another dish that you can take to a get together. it all started with my mother’s nacho dip – 5 layers of baked goodness – but i took her dip up a few notches to 7 layers of madness. brown the meat and drain off the fat. while the meat is browning, spread the can of re-fried beans on the bottom of an 9X11 glass dish. 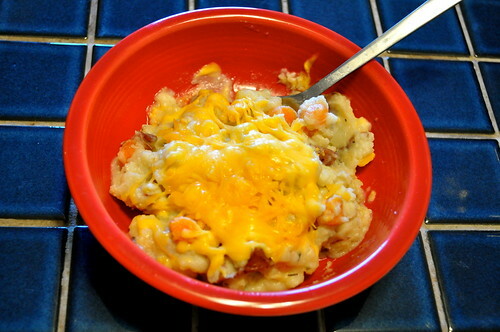 add the browned meat on top of the beans and follow with the cheese, reserving some for the top layer. carefully spread the sour cream on top of the cheese making sure to not mix up the other layers. 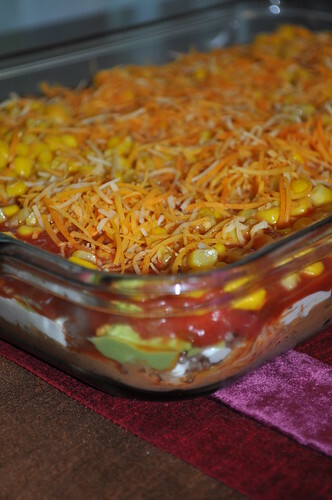 add the avocado, salsa and corn and then top with the reserved cheese. this is best served with a sturdy chip. there’s a lot to get in one scoop! i did not bake this but next time i make it i think i will try doing so. it’s great cold so i’m sure it will be extra delicious warm. enjoy! i was told to make more pork. so this is my attempt at more pork recipes. cook the egg noodles to the directions on the package. 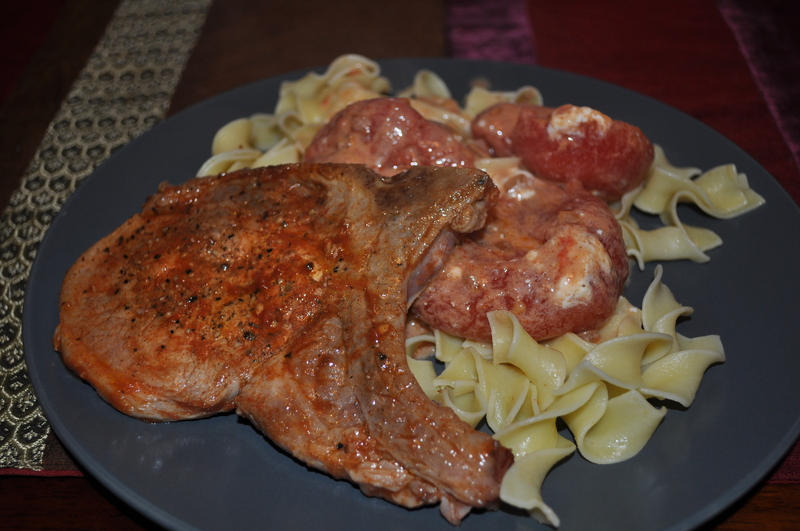 while the egg noodles are boiling, season your pork chops with salt, pepper and paprika. in a large skillet heat 1 tablespoon of oil over medium-high heat. cook the pork chops, flipping once, until brown. transfer to a plate. return skillet to the stove and reduce the heat to medium. add the remaining tablespoon of oil and cook the onion until soft. add pork, remaining tablespoon of paprika, tomatoes with juice and 1/2 cup water. bring to a boil and then reduce to a simmer. cook until the sauce has slightly thickened, breaking up tomatoes with a spoon, about 5 minutes. remove skillet from heat and stir in the sour cream. season with salt and pepper. serve paprikash over noodles and garnish with parsley if desired. it is best to use pork loin than chops, but chops was what i had. it would be easier to use the cubed pork in the skillet. either way, it turned out well. a nice Hungarian meal to satisfy the hunky craving.